HE'S IN THE END ZONE -TOUCHDOWN! 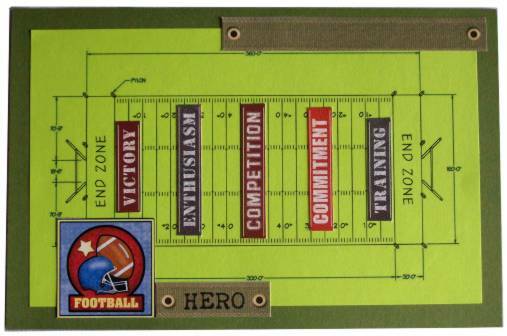 Background for this card is a print of the specifications for a US football field. I copied onto green paper and embellished with stickers, stickers, and more stickers. 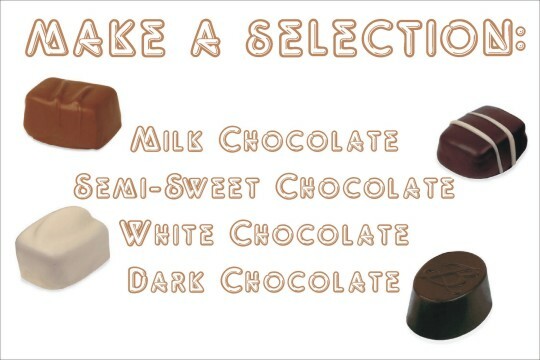 This was compiled in CorelDraw9 and refined in PhotoPaint9. Xylene is a chemical used as a paint stripper. I used a product called "Goof-Off" for my transfer. The paperweight is from the Dollar Store and comes off from its base to insert ones own artwork. 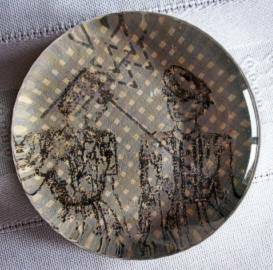 I used the xylene on a photocopy of ladies from an old dress pattern and applied the transfer directly to the back of the glass. 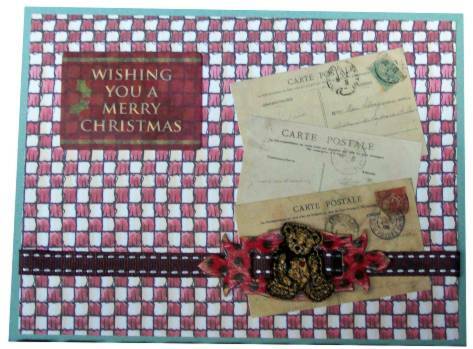 This is layered over a piece of dress pattern tissue and a circle of checked scrapbook paper. I am not too fond of the 'mushiness' of the image one gets with this transfer methid. 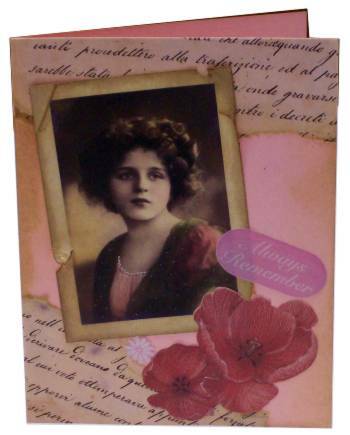 The spools of thread on these cards are wound with thread to match the papers and ribbon used. Buttons and needles are added in coordinating colors as well. I was finding this easy to put together so I did three at the same time. Now THIS is my kind of election! By the way, today is the one-year anniversary of this blog. Leave a comment on this entry and I will draw names on the June 30. Three winners will receive a project from the A-Z challenge as a thank-you gift for reading this year. 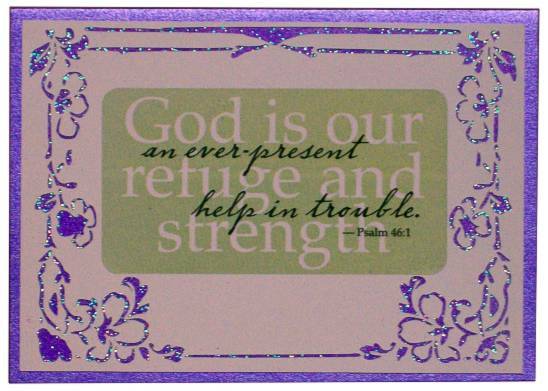 I distressed the background card with ink as well and layered printed tissue paper. The flowers and greeting are stickers. Cream pearlized cardstock, blue canvas print scrapbook paper, red crackled print scrapbook paper make up the background. 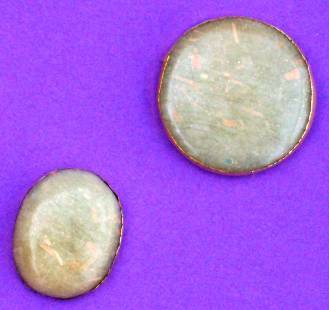 Two holes are punched for ball-chain to thread through. 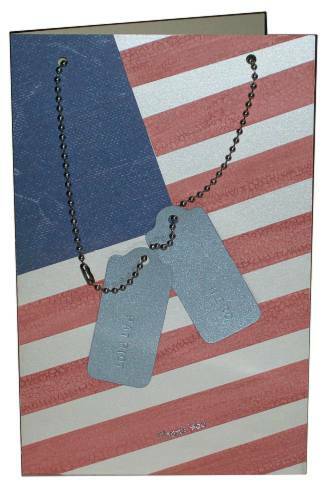 Two tags punched from silver cardstock have been impressed with metal letter punches. They read PATRIOT and HERO. The last step was to apply Thank You stickers to the bottom. The first shrink plastic I have ever done! I colored some white product with 'latte' alcohol ink and stamped the bear with Staz-on black ink. He was cut close to the lines and shrunk with a heat gun. Mr. Bear sits on a chipboard buckle with a brown ribbon. 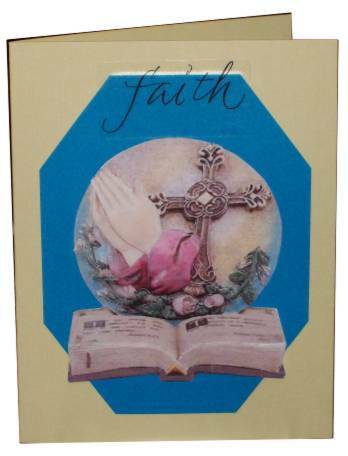 Stickers (postcards and greeting) over scrapbook paper finish it off. For those not 'in the know' redline tape is a super high-tack adhesive that comes in rolls and in sheets. For this card I used it as a sheet of adhesive under this cutting that a friend made with her Wishblade. Then I sprinkled with ultrafine glitter. The test is a vellum sticker. 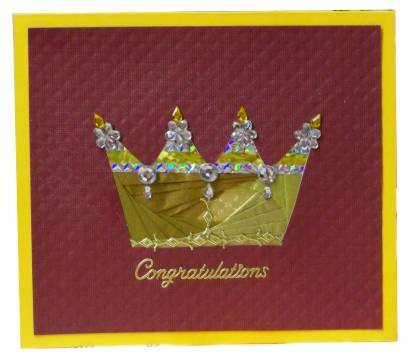 This crown iris-folding starts with an iris-folding rubber stamp. 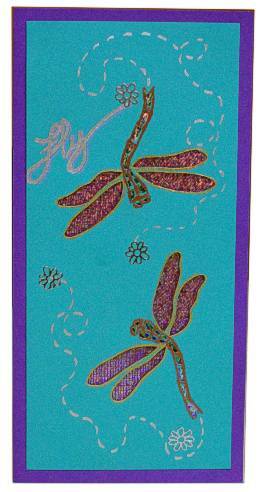 I embossed the background with my Cuttlebug using a Fiskars texture plate before cutting out the aperture. I used folded strips of metallic tissue paper for the fill and embellished with sticky-back rhinestones. 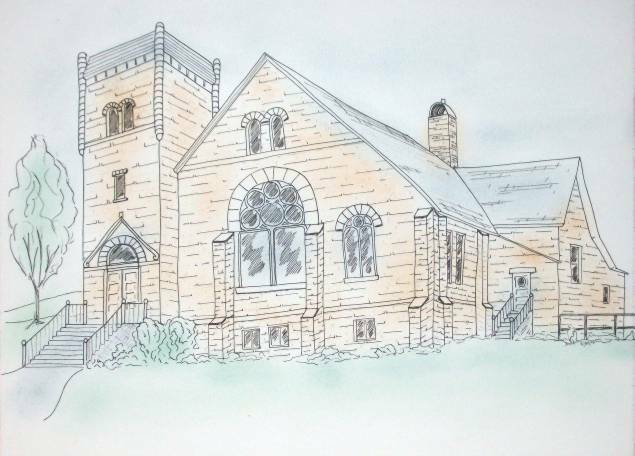 This church in Balderson, Ontario, Canada is so beautiful that we comment on it every time we pass by. We finally stopped and took a picture last time through. My husband loves it so much I did this pen and ink drawing for him. I used pigma pens on watercolor paper and tinted it with Ranger distress inks using bushy brushes. My first play with translucent polymer clay. Slightly tinted with 4 other colors in marbled effect and included with irridescent plastic chips and micro glitter. When baked it was sanded and then I used Future Floor Wax for shine. They have metal tape bezels. These are shown about 1 1/2 times actual size. 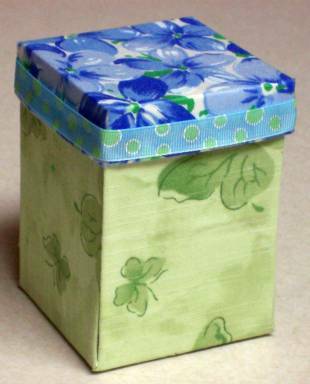 I made this kit for sewing notions from a pattern on Carol Duvall Episode CDS-1307. She calls it the Falling Down Sewing Kit because, when the lid is removed, the sides all fall down flat providing access to all the supplies. 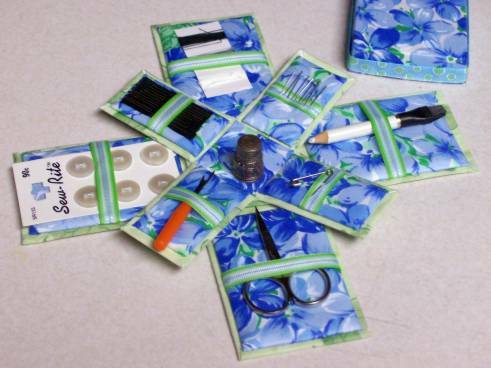 I stocked mine with small scissors, three tones of thread, a white fabric pencil, straight pins, needles, white buttons, safety pins, a seam ripper, and a thimble. I used two fabrics patterns, two ribbon patterns, posterboard, and tacky-glue. 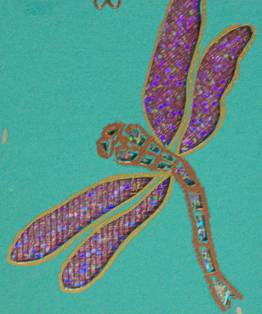 I cut the dragonflies into their stencil shapes and backed just the wings with burgundy mesh. Behind all of them I placed a glittery silver mylar. 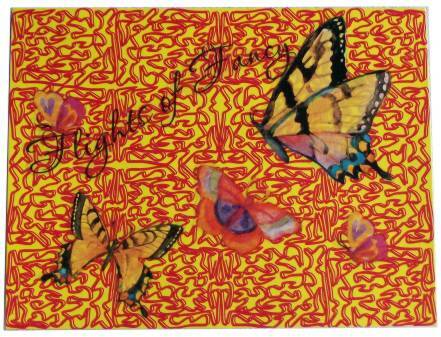 The wings are outlined with gold leafing pen, the bodies with copper leafing pen and the flight paths and text drawn in with silver leafing pen. 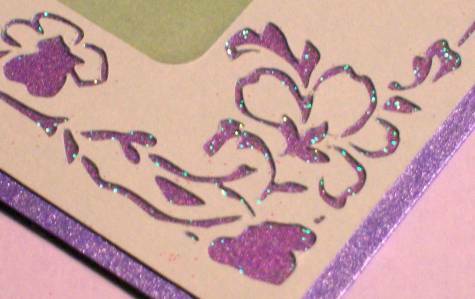 I added a few silver peel-off flowers and mounted on a purple card. Here is a closeup of one of the dragonflies. 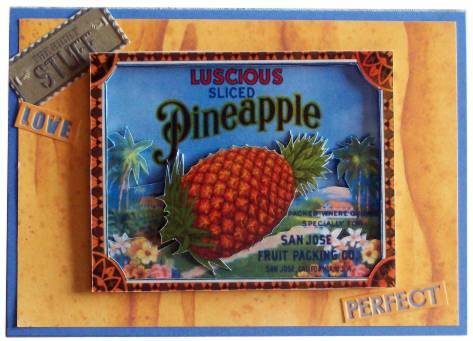 This reproduction fruit crate label was printed out four times and cut into a 3D illustration. I set it off on a woodgrain paper over blue cardstock and added three text stickers. OK, I hate this card! But them, I hated the theme I was supposed to use, too. I started doodling on the computer and made mirrored and rotated duplicates to form a tile pattern. The red lines are shadowed by thinner orange lines and set on a yellow background. I ended up with a Indian feel to the image. To this I added butterfly stickers in coordinating colors and a slear text sticker. So there! I did it - and I never have to do it again! When I pulled together these definitions (printed scrapbook paper), a premade pocket, a tag, and a text sticker for the tag, I was delighted to discover they all coordinated so well. I pulled some scrapbook paper in the same color family for the background and found I had these drafonfly stickers that matched as well. Excellent! 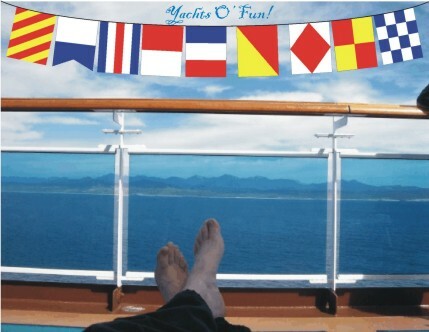 Most any card can be turned into a get well card with the addition of a peel-off greeting. 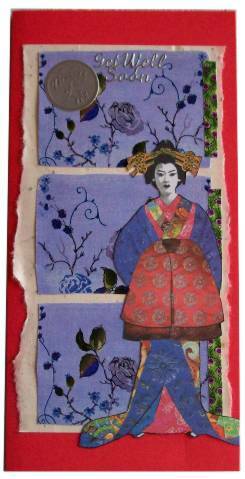 I've added a 'thinking of you' dot as well to this collage of oriental elements. I got this 3D picture from an online group friend and knew it was just for this theme. When I had finished putting it together I laid it down and it happened to land on something with this shape and color. WOW! 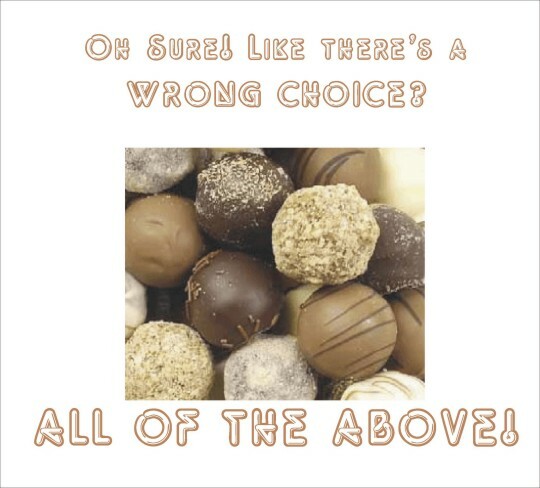 I went right to the studio and cut the background shape and put this card together. The text is a clear sticker. This was a tough one for me because I don't lean toward grunge, worn, rough-looking art. 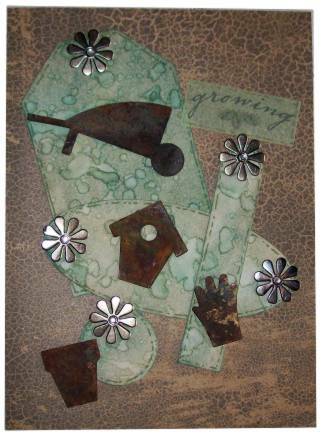 I did have these rusty metal garden pieces given to me some years ago. This was the perfect opportunity to use them and I elected to do a distress background on a collection of tags to showcase them. 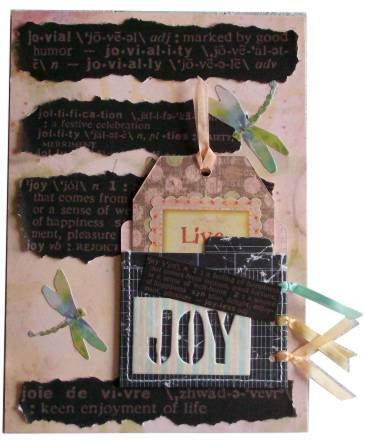 A crackle-paint printed scrapbook paper serves as the background. Of course, I had to try to pretty it up somehow so I used metal flower brads in each of the tags' holes and added a clear rhinestone to each of them. The text is a vellum sticker. I used a moss green Sharpie marker to outline each of the tags and the text.